The church: St Ignatius of Antioch, New York City, USA. Denomination: Episcopal Church in the USA. The building: Angelic Gothic charm, somewhat the worse for wear from water damage. There were many angels about this altar  besides the invisible ones  appearing on the reredos and delicate stained glass windows. This small church illustrates the rare and quite delightful quality of being both rich in furnishings and very tasteful, with nothing overdone. 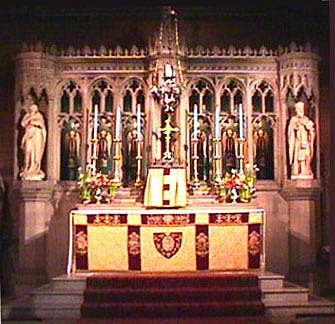 Typically Roman furnishings (ornate baptistry, Stations of the Cross, "old style" confessional, elegant gold crucifix, large vigil lights) were blessedly combined with classic English restraint. The Lady Chapel had a lovely reredos, reminiscent of the Middle Ages. The building did not appear to be in the best of repair. The neighbourhood: Typical New York City: middle-class blocks of flats, discount stores and small-scale restaurants. The cast: The preacher was Rev. Roger Gentile. The names of the other clergy were not listed in the leaflet. About one-third full, perhaps 50 people. I received a pleasant, dignified greeting from the female usher, who not only handed me the leaflet, programme and hymnal but kindly led me to the loo when I requested its location. It was average  comfortable enough, but a bit too narrow to enable easy kneeling. The atmosphere was generally quiet and prayerful, with some members of the congregation deep in meditation or lighting candles before one of the statues. A few people were carrying on conversations, but in whispers. Booklet with the ECUSA Rite 1, Hymnal 1940, leaflet with directions for finding hymns, settings, and prayer options in the other materials. Though it had its charm, seeing a few people walking about with small children was a mite distracting  although better than the alternative of hearing the kids cry. Anglo-Catholic of a variety that is so High one could nearly get the bends. 7. The sermon was rich in content and well structured, relating the transfiguration, passion and resurrection of Jesus to our call to discipleship, with equal measures of solid ascetic theology and common sense. I particularly liked Father Gentile's stress on how suffering is not to be sought or desired, but that Christian sacrifice involves discipline which is "90 per cent giving up our own ideas, and listening." Our road to discipleship, as mentioned by Jesus before his transfiguration, is the way of the cross: death and resurrection is the road to this Jerusalem. The beautifully reverent moment of consecration... especially with all of those angels looking on. Nothing in the service itself was hellish, but seeing several people who were obviously ill begging in the street and on the subway was very painful. One beggar had a prescription for cancer medication and was requesting help in order to obtain his medicine. I was not lost for long  it was off to the Lady Chapel for the anointing, which was beautifully done. There was a coffee hour, but when I learnt that one could receive the laying on of hands and unction for healing after Mass, I decided that would be stronger medicine than coffee. 6. Lovely though the service was, and High Church Anglo-Catholic though I am, it was perhaps one step higher on the ladder than I care to be on a regular basis. The homilist's excellent explanation of discipleship.